This chapter describes methods for the analysis of autophagy proteins in C. elegans aging. 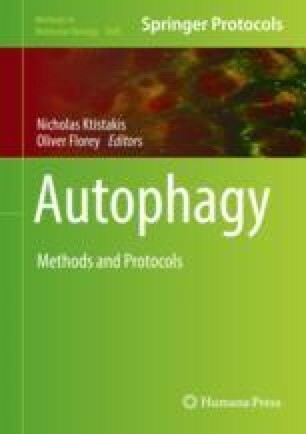 We discuss the strains to be considered, the methods for the delivery of double-stranded RNA, and the methods to measure autophagy levels, autophagic flux, and degradation by autophagy. Work in the Henis-Korenblit laboratory is supported by grants: no. 2013188 from the Binational Science Foundation, no. I-1211-309.13/2012 from the German-Israeli Foundation for Scientific Research and Development, and no. 3-12066 from the Israeli Ministry of Science, Technology and Space, and work in the Meléndez Lab is supported by grants R15GM102846 from the National Institute of Health, a PSC-CUNY Research award, and A.M. was an Ellison Medical Foundation New Scholar in Aging (AG-NS-0521–0).